I call this a classic because its something I used to do as a child. The twist? Do it on the light panel, of course! This activity evolved today as my son was painting with watercolors. Once the water turned a color, he asked me if we could do colors in water on the light panel. So we did. Then he told me he wanted "the volcano water". I knew what he was talking about....vinegar + food coloring + baking soda....of course. 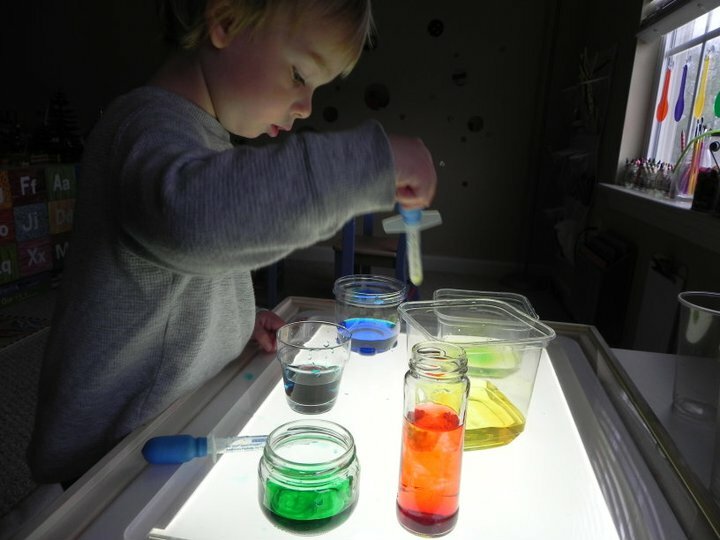 For him it was really just a fun sensory activity, but for younger children it can be a fun way to learn colors, basic skills such as squeezing (food coloring), stirring, and pouring. There are also tons of new words that can be introduced to little ones during this activity. We talked about the smell, the sounds, and the visual aspects. We put baking soda into a large shaker (from the dollar store) and he shook out the baking soda a little at a time. Putting hands in bubbly vinegar is a must!! My son and I went to Home Depot soon after this activity. His hands were completely stained purple (I think the vinegar helped with that). Some lady stopped me to tell me that his hands were purple with a look of shock on her face. LOL!! Then she inquired as to HOW they got that way! Im pretty sure she walked away in shock. It was too funny!! I didn't even notice they were purple until she said something....which makes it even funnier to me. Where did you get your light box from? Great idea! My husband and I teach a sunday school class for kids and young adults with special needs. After seeing this post, we're talking about setting up a light box in our room. I'm obsessed with this light box - so many ideas! Does anyone have suggestions on where to get one or which one to buy? May I ask where you got your clear container? I haven't been able to find them attached like that!